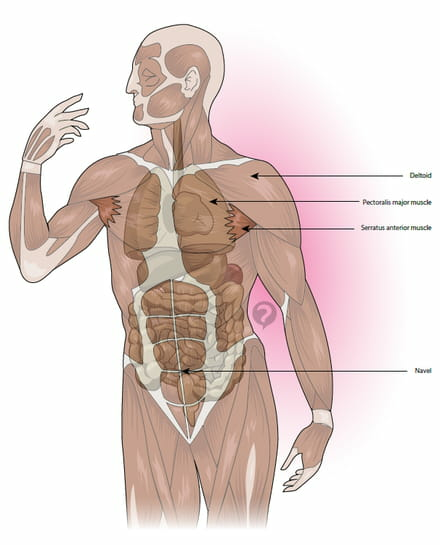 The torso is an anatomical part of the body. It comprises the anterior portion between the base of the belly (upper abdomen) and the neck, shoulders and chest thus part. The internal organs are underlying the lungs and trachea, esophagus, stomach and heart. The torso is composed of muscles (pectoralis major and minor, anterior bundle of the deltoid, rectus abdominal ...). In men and women, the breast is also part of the torso. Original article published by Jean-François Pillou. Translated by Marjorie Gaulier. Latest update on August 20, 2014 at 05:33 AM by christelle.b. This document, titled "Torso - Definition," is available under the Creative Commons license. Any copy, reuse, or modification of the content should be sufficiently credited to CCM Health (health.ccm.net).